The arts offer opportunities for thinking, planning, experimenting… and rethinking when projects don’t turn out as planned. The skills that art-making teaches can be applied to just about any endeavor. Many students learn best through hands-on projects and retain fond memories of field trips or guest educators that give them the opportunity to express themselves in new ways. The Museum’s ArtReach; Have Art, Will Travel; and Museums in the Museum! programs use fine arts as a curricular bridge to culture, language arts, science and history. The Academy Art Museum reaches out to schools and community groups to offer meaningful field trips in conjunction with its exhibitions. 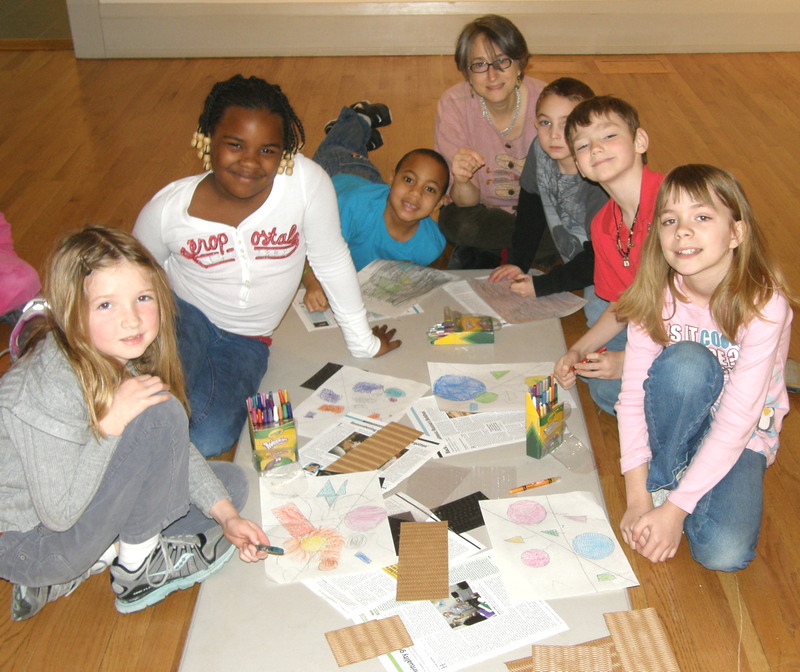 A typical ArtReach experience includes a gallery tour and a related art or language arts project. Budget woes? No problem! There is no charge for ArtReach. The Museum also pays for transportation costs for students in Talbot, Caroline, Dorchester, Kent or Queen Anne’s counties. The Museum designs meaningful projects for students in pre-K through high school and can tailor programs to meet individual groups’ needs. For more information about the Museum’s ArtReach program, contact Director of ArtReach and Community Programs, Constance Del Nero, at cdelnero@academyartmuseum.org. The Museum knows that it’s not always easy for teachers to book field trips. Sometimes scheduling does not permit for students to be out of the building or for art teachers to find subs. Why not have a Museum educator bring along a work from our permanent collection for viewing and discussion followed by a related art project? It may even be possible to align Museum projects with your own curriculum. Please contact Director of ArtReach and Community Programs, Constance Del Nero, at cdelnero@academyartmuseum.org for more information. As with ArtReach, there is no cost for Have Art, Will Travel! The Academy Art Museum’s Museums in the Museum! program teaches children how a museum functions, asks them to consider what their ideal museum would look like, and helps them create their own miniature “museum” in a diorama box. The project hones students’ visual art, language arts and research skills. In the fall, Museum educators travel to participating schools to introduce students to the curriculum and answer any questions they may have. Students come to the Museum at least twice in the school year to see different exhibitions and gain an understanding of how curators work. At the end of the school year, students transport their “museums” to the Museum for a special evening exhibition and pizza party. To find out more about the program, please email the Museum’s Director of ArtReach and Community Programs, Constance Del Nero, at cdelnero@academyartmuseum.org. The Museum’s Annual Mid-Shore Student Art Exhibition is the largest and most prestigious on the Eastern Shore. Every year, K-12 art teachers from Talbot, Caroline, Dorchester, Kent and Queen Anne’s counties submit a variety of their students’ best work, including painting, drawing, sculpture, photography, and printmaking. Grades 9-12 Thursday, March 14, 2018, 5:30-7:00 p.m.
Every fall, the Museum hosts a special Portfolio Night for area high school students. Students bring their artwork to receive expert tips from a panel of art school and university representatives. The evening is ideal for high school seniors who are considering applying to art school and underclassmen who would like to get a leg up on preparing a strong portfolio. Parents, teachers and guidance counselors are also welcome. Look for 2017 Portfolio Night information at the beginning of the 2017-2018 school year. Please email the Museum’s Director of ArtReach and Community Programs, Constance Del Nero, at cdelnero@academyartmuseum.org for more information. The Museum offers art and elementary classroom teachers the chance to learn new tricks, talk art, swap project ideas and come away from a workshop with renewed energy and enthusiasm. New research shows that there is a variety of learning styles and many students learn best through the arts. Researchers also note that the compartmentalism of core subjects is artificial; there is art in math and English language arts just as surely as there are onions in soup! To date, our teacher in-service day program has designed ten different projects for area K-12 teachers. How might the arts help your students learn? The Museum can help you plan a low-cost in-service day for teachers in your school or district. For more information, please get in touch with Director of ArtReach and Community Programs, Constance Del Nero, at cdelnero@academyartmuseum.org.